Recently I fell in love. Mercury Glass Cloche love. But, the cost of this love was just too high. So, I had to settle for what might have seemed to be second best at the time, but in reality turned out to be the perfect one for me all along. That Pottery Barn kind of love is just too expensive for this heart! 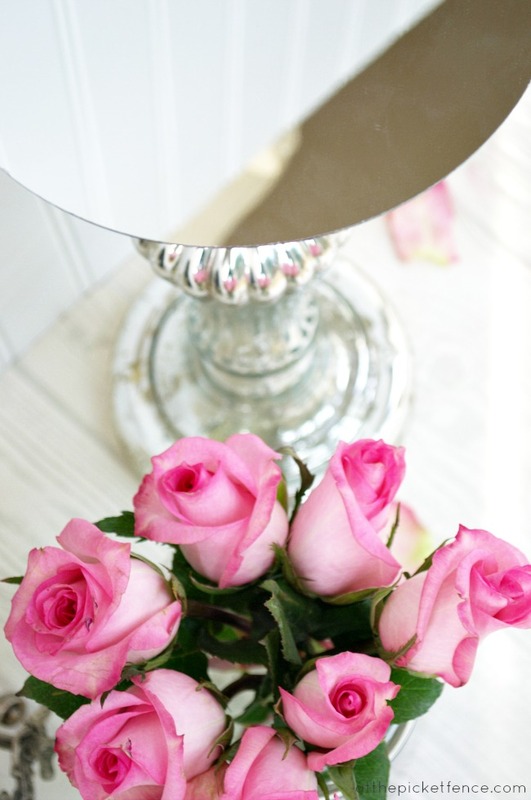 All I had to do was take a mercury glass candlestick, add a round mirror and a glass dome and voila…love blossomed right before my eyes. Of course this lovey-dovey stuff made me think back to falling in love with my one and only many moons ago. We have been on a lot of adventures together and one of my most favorite has to be our trip to Europe in 2002. It was truly a dream come true for this Anglophile to roam the streets of Bath, marvel at sheep grazing in a pasture in the Cotswolds, gaze up at Big Ben and watch a production of “My Fair Lady” in the theater district. I felt very close to Jane Austen. And Charlotte Bronte. I could think of nothing better to fill my romantic Mercury Glass Cloche with then mementos from this very romantic excursion. And I couldn’t resist writing out on a chalkboard a line from one of my favorite songs right now…one of those ones that sticks in your head and you can’t get it out but in the end decide that you’re OK with that ’cause you like it so much! While sifting through photos and postcards I also remembered another souvenir that came back from England. Only this one came to me from my then boyfriend, now husband. He back-packed around Europe with friends after college graduation. We had only been dating for a few months and I wondered how him being gone would affect our relationship. But when he gave me this gift I knew I should never have worried. 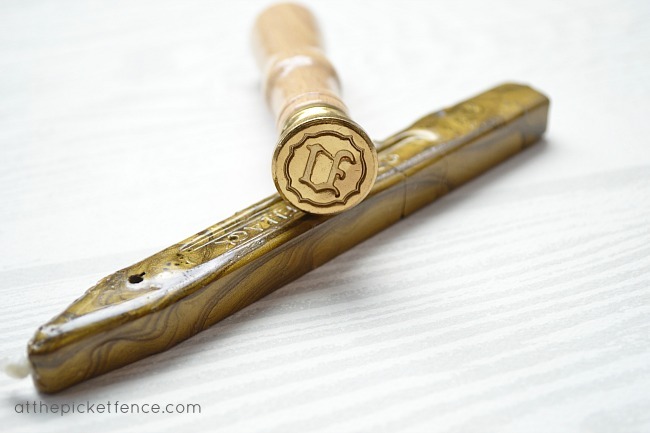 He knew how much I would love something as simple as seeing my scrolled initial in brass on a beautiful wood-handled stamp. 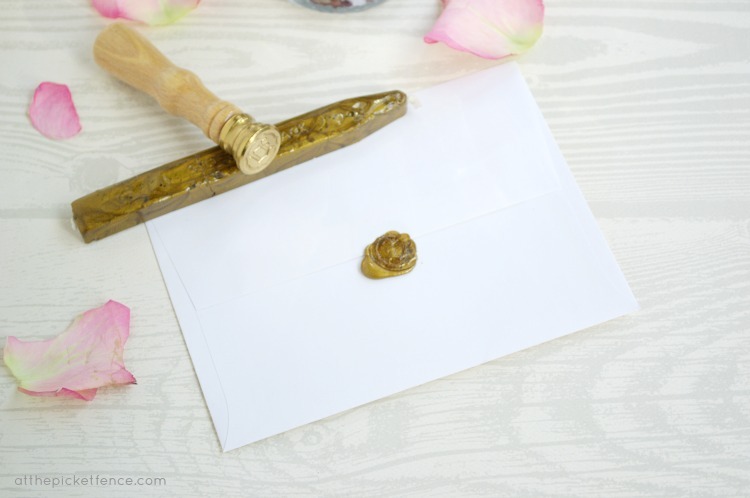 And how my heart would thrill at also having a bar of wax to melt down so that I could press that initial into it and seal those letters like I was royalty. But did he know that I secretly wished that the initial on it was different? That like the song, “I’d like to add his initial to my monogram”? At the time I dreamed about the day that he and I would have the same last name. And it wasn’t long before that dream came true. And now I look at that stamp and I’m reminded of that sweet time in our lives. Of butterflies in my stomach and wondering if he was “The One”. Of long walks and even longer talks. Planning and dreaming of our future. I think back to that decision all of those years ago and marvel at how young we were. How much we didn’t know…couldn’t know about what the future held for us. I think about the roller coaster ride of life…and how there is no one else in the world I would want to be strapped in next to as we go careening through it. So, Happy Valentine’s Day to you, my love. Thank you for asking me to “add your initial to my monogram”. It was the best thing I’ve ever done! 29 Comments on "A Love Story"
This is just the sweetet post and a tribute to the love of your life. I love the idea for the cloche and I might just have to borrow it. 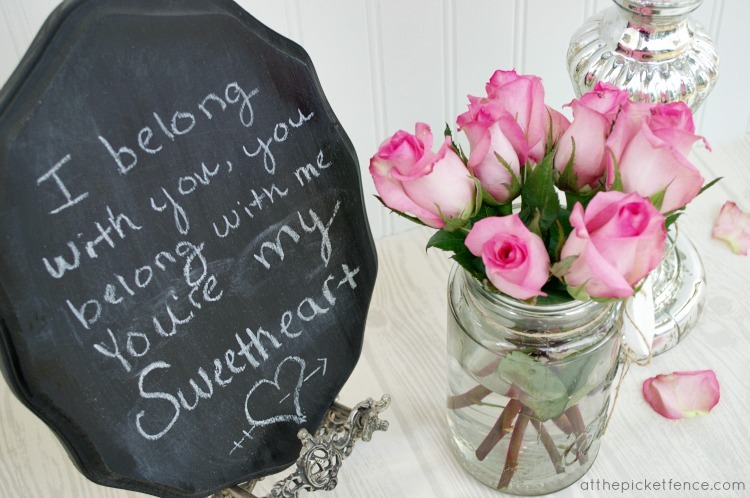 What a sweet gift that sealed a beautiful relationship. OMGosh Vanessa…I was in London back in 2002 with my then new fiance just about 10 days after the date on your ticket stub. I loved London…we were there for 4 days and then flew to Greece for another 10 days. What a small world! 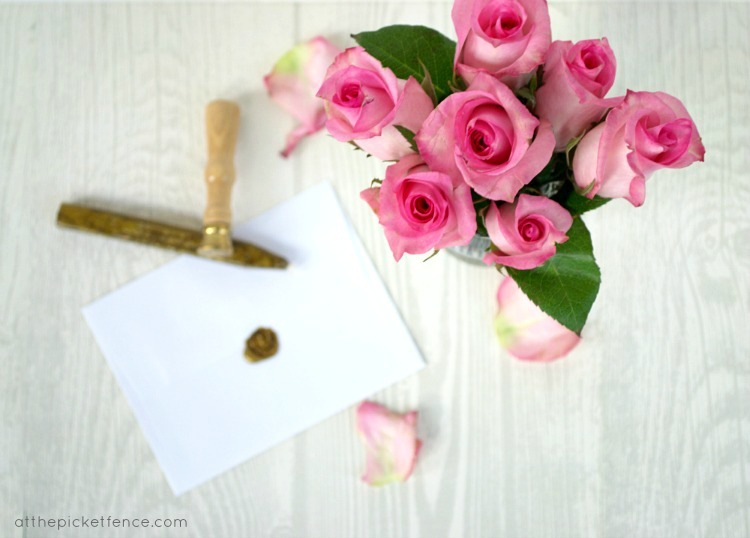 This is such a beautifully written and heartfelt post…isn’t new love wonderful? And as lovely as it is, building a life together filled with treasured memories is a priceless gift. Wow Barbara!! How crazy is that?! London was truly so amazing and I can’t wait to go back someday. Next time I’m hoping that Italy might be on the agenda! It’s beautiful! I am a huge mercury glass fan. My collection is constantly growing. Marshalls and TJ Maxx are great places to shop. They are so much more affordable than PB and there stuff is gorgeous! What a sweet post. Beautiful cloche and what a great idea to fill it with those treasures. Happy Valentine’s Day, my friend. I love your DIY cloche and I’m thinking I could copy you and if you didn’t tell me, I would think you bought it like that!! What a wonderful trip to Europe you had with your husband, a memory that will stay with you forever and how you fixed your cloche with the mementos of your romantic trip, is just fabulous! I love you cloche creation and the story that goes with it…I am stil looking for the perfect one for me! Such a beautiful display of your first days together! 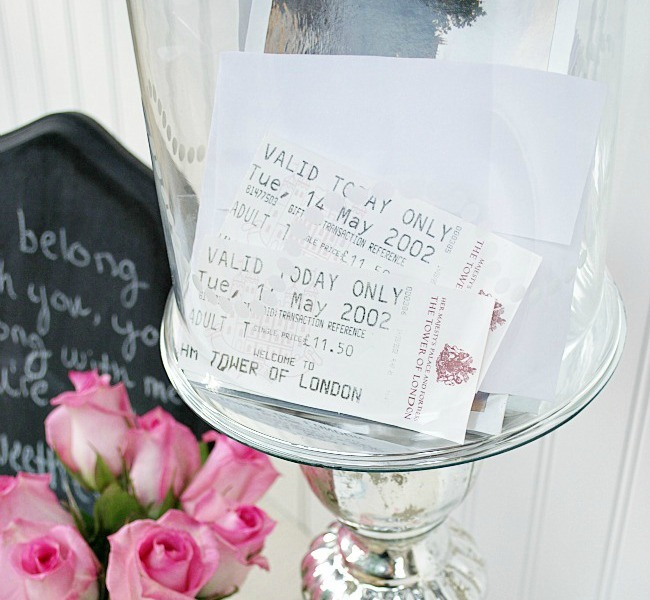 I love the cloche and the sweet story of the mementos you’ve saved. I also love the creative way you put together the base. Hope you ladies have a wonderful Valentine’s Day! Vanessa, What a sweet post. Thanks so much for sharing. Happy Valentine’s Day to both of you! What a sweet post Vanessa! Your cloche is beautiful!! 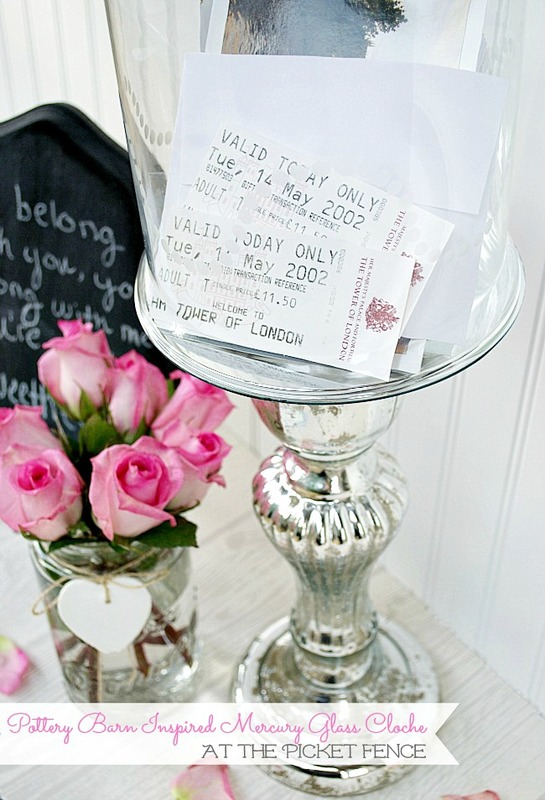 What a lovely post!Such beautiful memories of a special night!Great idea to share that special token under glass! Lovely – all of it! The cloche on the mercury glass candlestick and the love story! And the wax seal too! So glad you found each other and made it permanent nearly 15 years ago. Your love for each other has been a gift to us! Happy Valentine’s Day! I LOVE this post! Of course you should never have worried…..he was perfect for you! Happy, happy Valentine’s Day to you and you are such a blessing to me my wonderful friend! Wahhhhhhhhh! What a beautiful love note about your hubby. I came over for the cloche and stayed for your sweet love story. Thank you. Vanessa, that is so sweet!! I love this cloche you made. You are so clever, but the story was ever better. Go hug your Valentine!! Aww so sweet. Love the cloche idea! You are truly a romantic at heart, Vanessa! You always have such sweet stories to tell. Hope you get back to Europe again. 🙂 Maybe with the kiddos when they are old enough to appreciate the visit. Vanessa…what a truly beautiful love story…thank you for sharing this..
Love the memory filled mercury glass cloche…So glad that you had found your soul mate! This is beautiful and such a lovely story! !